Dr. M Ravi Kanth, CMD HUDCO presented interim dividend of Rs. 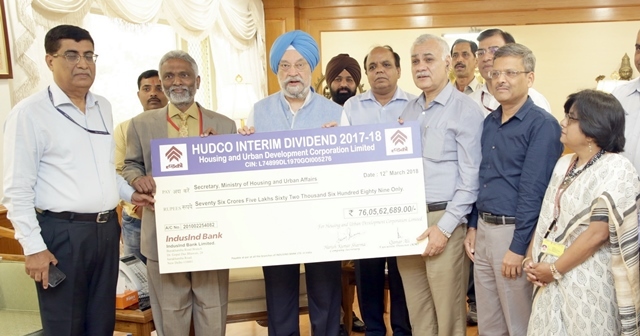 76.05 crore to Shri Hardeep S Puri, Hon’ble Union Minister (Housing & Urban Affairs), in the presence of Shri D S Mishra, Secretary (HUA), and other senior officials of the Ministry. HUDCO also paid dividend of Rs. 22.83 crore to the Ministry of Rural Development, and Rs.11.22 core to other share holders, HUDCO being a listed company.